Background: One often unrecognized aesthetic deformity of the temporal region and forehead is that of an enlarged superficial temporal artery. (STA) This most commonly affects the anterior branch of the STA where it takes off from its Y-split from the posterior branch of the STA. However in men with very close cropped hair or who shave their head, an enlarged posterior branch may also be of aesthetic concern. Such enlarged vessels appears as ‘worms’ making their way to the forehead and are often mistakenly called veins.Because the anterior branch of the STA such like the branches of a tree it usually has multiple tortuous extensions. The aesthetic treatment of an enlarged STA is tying off the prominent blood vessels also known as temporal artery ligation. One of the common misconceptions about the procedure is that it is done at a single proximal point. But shutting off the forward flow is not likely to cause its prominence to be diminished much or at all. This is due to back flow that comes from the anastomotic connections from the vascular network from the other side of the scalp. It needs both forward and back flow shut off to eliminate the pulsatile flow through the vessel which is what makes it visible. 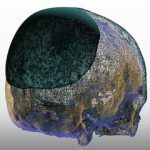 Case Study: This middle-aged male had a prominent vessel in the right temporal region that extended up into the forehead. It became particularly prominent when out in the sun or in warm weather. It was a single large vessel that did not have an obvious branches to it. Under local anesthesia, a four level ligation pattern was marked along the irregular pathway of the anterior branch of the STA from the hairline out into the foerhead. 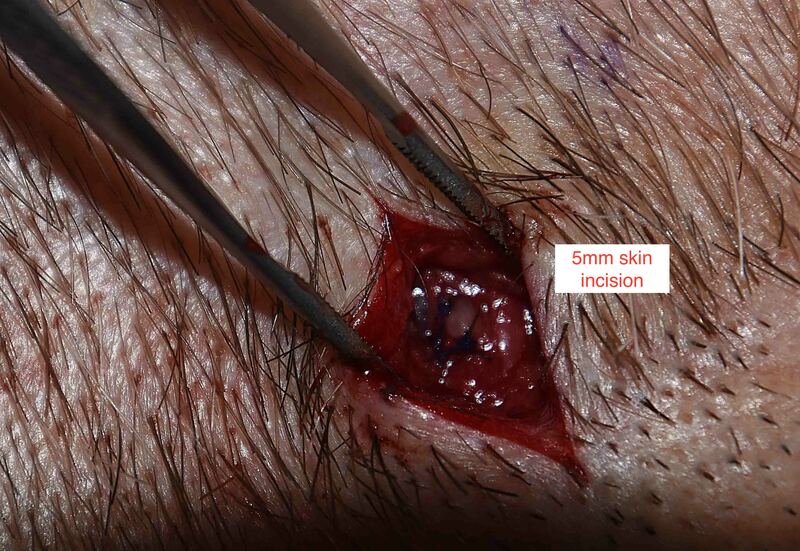 Using 5mm incisions at each level the artery was double ligated with 5-0 proline suture. He presented one year later for STA ligation on the left side. A evaluation if the right showed minimal vessel prominence and well healed scars that were essentially undetectable. Even in the treatment of a solitary vessel pattern prominent STA, a single proximal and distal ligation may not be enough. Between the two widely separated ligation points there may be and surely have to be other branches feeding into the main one that are unseen. These would likely emerge later as they dilate up with a lower pressure gradient from the main vessel. 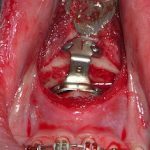 As a result it is prudent to do other ligation points between the most proximal and distal ligation sites. 1) Enlarged branches of the superficial temporal artery are usually multiple and rarely a singe branch. 2) A single branch superficial temporal artery enlargement still requires multi-level ligation treatment. 3) Each ligation point involves a small 5mm skin incision with a double ligations using permanent suture.